You can't change your fate - so throw yourself into battle, because you'll either end the day a hero or drinking mead in the halls of the gods. That's what Finn's tribe believe. But Finn wants to live. 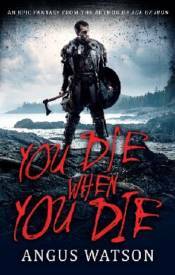 When his settlement is massacred by a hostile tribe, Finn plus several friends and rivals must make their escape across a brutal, unfamiliar landscape, and to survive, Finn will fight harder than he's ever fought before.